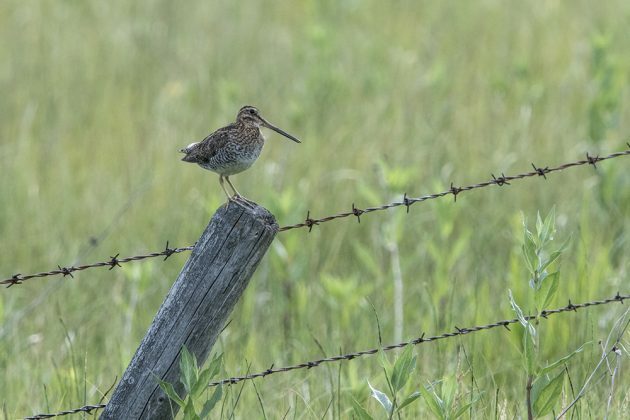 If you like birds on posts, if seeing “little brown jobs” posing nicely in the distance as you drive or walk along a dirt road only to have it fly away as you approach makes you deliriously happy, then North Dakota is the place for you. I love sparrows, so seeing a feather-worn Vesper Sparrow this past July filled my heart with joy. I was on New Jersey Audubon’s Grand North Dakota birding tour this past July, driving along dirt roads through the prairies of western North Dakota. Scott Barnes, N.J. Audubon Naturalist, and Linda Mack, N.J. Audubon Associate Naturalist, have led this tour many times, through tornados, droughts, questionable restaurants, and, sadly, the advent of fracking, and every one of my friends who has participated over the years has raved about the experience and the birds (in fact, one member of our group was on his third or fourth trip, I lost count). I wanted to see prairie birds and I wanted to experience a new state. 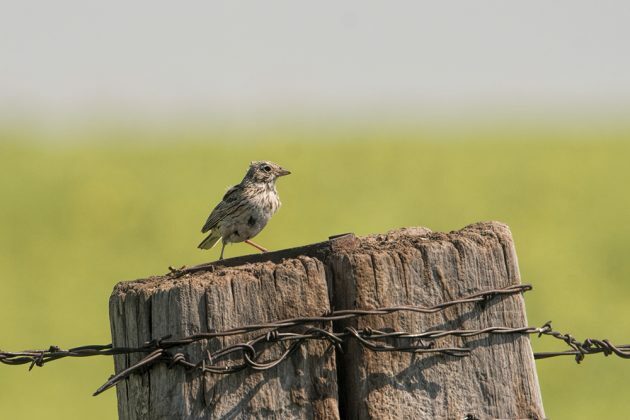 We saw sparrows–a total of 14 species–and we saw many other great prairie birds, and we often saw them perched on posts. 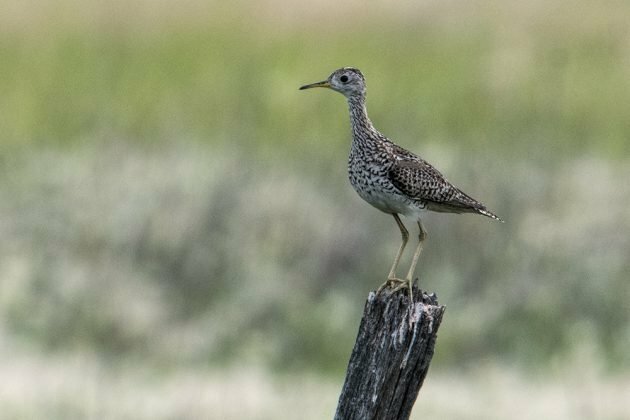 Upland Sandpipers were seen almost daily, on posts, in tall grass, in trees, and, of course, flying away from us. Wilson’s Snipe was another post bird. It was delightful seeing them so clearly, most of the time I’m trying in vain to photograph them in the reeds as they probe a muddy pond. 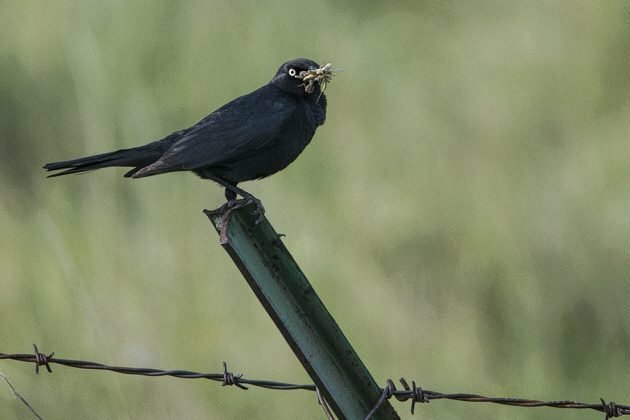 Brewer’s Blackbirds often joined the hordes of Red-winged Blackbirds flitting in and out of the taller grasses and few shrubs. There is a very good reason why you find so many birds on posts in North Dakota: There are no trees. Well, often there is one tree, situated in the middle of the grasses that edge over the horizon. 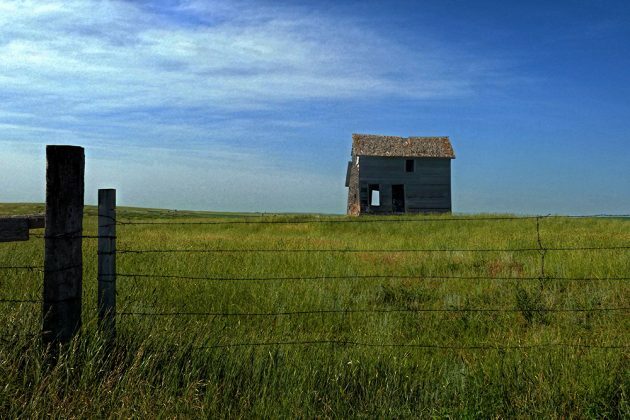 Over 80 percent of North Dakota’s prairie has vanished, but there are still millions of acres in North Dakota, under both government protection and private ownership. 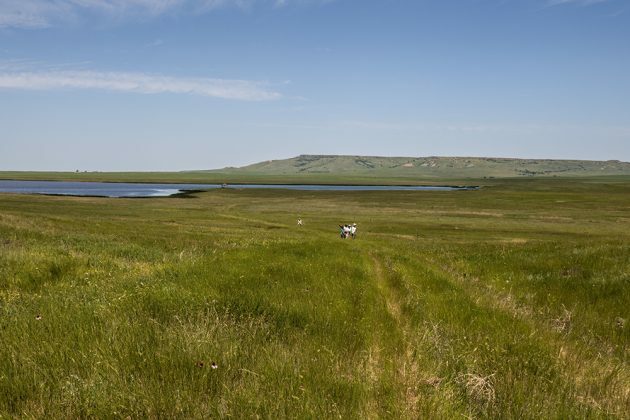 The Little Missouri National Grassland in western North Dakota covers over 1 million acres and is the largest grassland in the United States. Sadly, very little tallgrass prairie, one of the three types of prairie in North Dakota, is left. I don’t know much about prairies, but I have discovered that there is more to them than just grass, and that they are home to hundreds of butterfly and bee species and thousands of moth species. 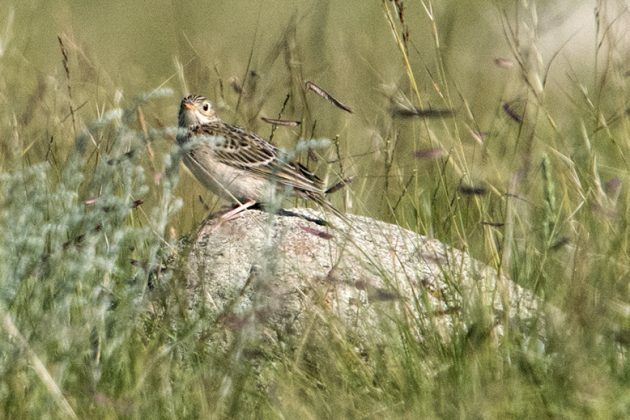 In addition, of course, to birds like Baird’s Sparrow, Chestnut-collared Longspur, and Sharp-tailed Grouse (all of which were life birds for me, and all of which I failed to get decent photos). I did get great images of Lark Bunting, a bird which I’ve seen previously, but which was always too far out of reach for a decent image. That’s the male on a metal post in the featured image of this blog post (gotta differentiate the blog posts from the wooden posts! ), and, above, the female on a barbed wire fence. A bird on the wire (I’m not a Leonard Cohen fan, but I know certain birders who are) is just about as common as a bird on a post in North Dakota. These Lark Buntings were too occupied with gathering food to pay much attention to us as we walked along a road between farm fields; there was undoubtedly a nest nearby, in a scape on the grass, so we took our photos and walked on. There was a little color variety in our birds of posts. 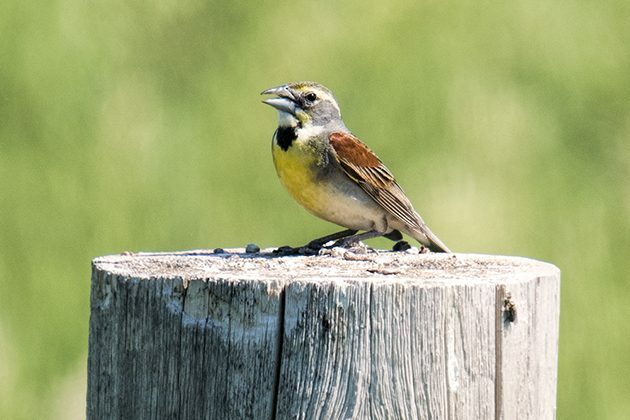 We observed Dickcissels on wooden posts and Western Meadowlarks on metal posts, both featuring brilliant yellow contrasted with ebon black. The flutey song of the meadowlark echoed around us wherever we went in and around the grasslands, uplifting spirits as we searched for some of our more elusive target birds. Baird’s Sparrow was one of those elusive creatures. At Stewart Lake NWR, we heard the sparrow, we could have sworn there was one at our feet, but it was windy and sound travels and sparrows apparently don’t perch on a slice of tall grass (not a post in sight) when the wind blows. Here’s several members of our group walking back from the Baird’s Sparrow search–Variegated Meadowhawks and constantly flying Bobolinks helped ease the pain. 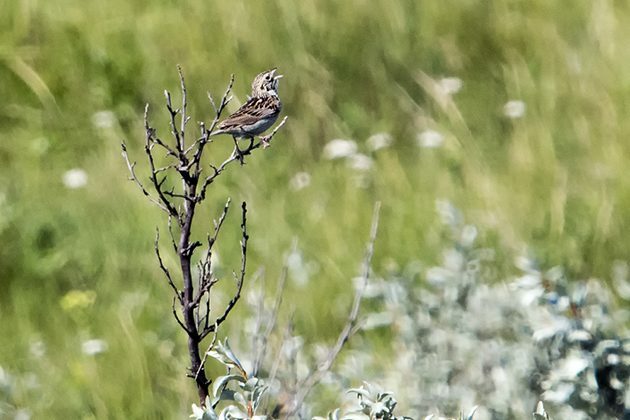 We finally got our Baird’s Sparrow several days later in Mountrail County, in a patch of state school land suggested by North Dakota birding guru Ron Martin. (We owe Ron a lot of thanks for this, there is no way we would have known this was publicly accessible land if he hadn’t told us.) 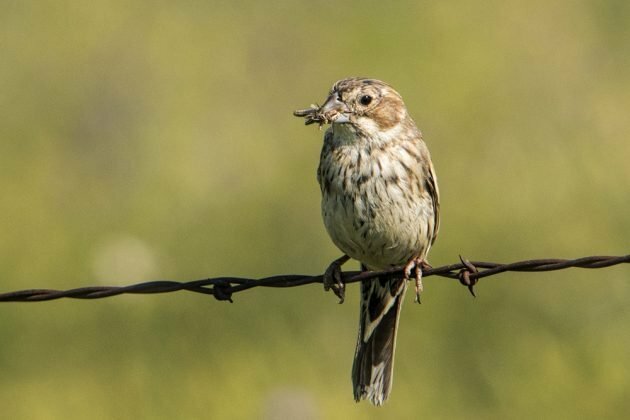 The North Dakota Birding Society website notes that “a prairie pasture that has Baird’s Sparrows one year may not be suitable the following year.” And, that they usually don’t perch on fence wires (and, I imagine by extension, posts). 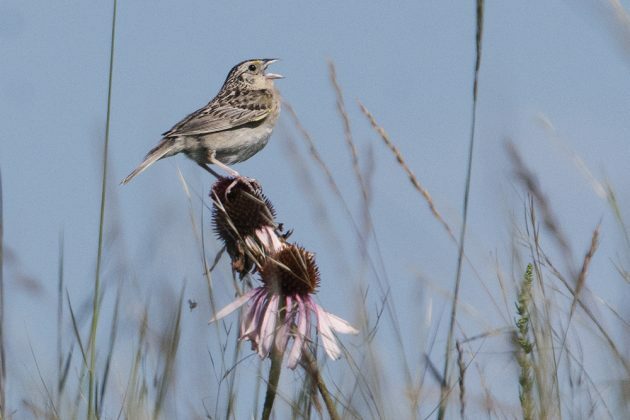 It was also in this no-name patch of prairie that we got killer looks at Sprague’s Pipit, a bird typically seen flying high up into the atmosphere, singing and gliding. (The male Sprague’s Pipit performs the longest known flight display of any bird and may stay up in the air for over 30 minutes, according to the Cornell Lab of O All About Birds website.) Scott, Linda, and our better hearing skilled birders had heard pipits several times during the week and seen them flying high, but the sounds and high-up sightings always eluded me. On this day, the birding goddess smiled. Scott saw the bird high up, Linda saw the bird plummet down, and John H. spotted where the bird landed! Yes, it takes a village to locate a Sprague’s Pipit. I need to add that Sprague’s Pipit, like many of the grassland birds we saw, are declining in alarming numbers. Since 1966, when the Breeding Bird Survey first began monitoring, numbers have declined 79 percent. Research indicates that this decline can be tempered by management of cattle grazing practices, preventing growth of shrubs and trees and the invasion of non-native plants. 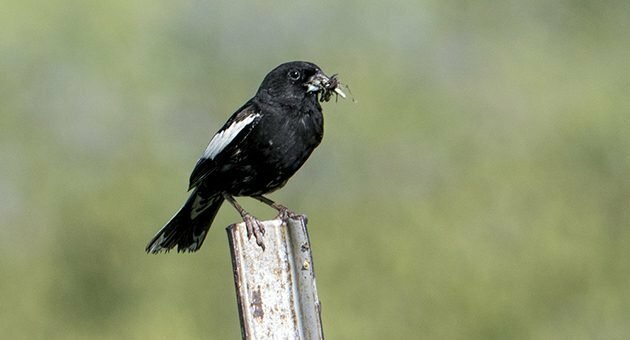 Birds of North America, the Cornell Lab of O data base, cites many studies on this topic and they don’t all agree on results and best practices. 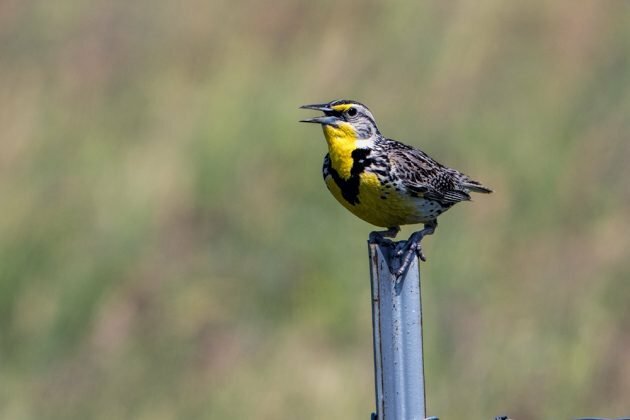 But, it seems to me the main ingredient for supporting grassland birds is to convince the ranchers and farmers to participate in these programs. We need to create bridges (and a very happy experience with a local ranching family led us to believe that this is possible). O.k., back to the birds. Right past the Pipit, on a rise, was a Grasshopper Sparrow singing on a Purple Coneflower, a flower we surprisingly saw everywhere. (I had no idea that Purple Coneflower’s name is Echinacea purpurea, and that it’s the source of the herb echinacea.) Grasshopper Sparrows were also seen on posts and wires everywhere we went; they are not very discriminating about where they perch, thank heavens, because it is one of my favorite sparrows. 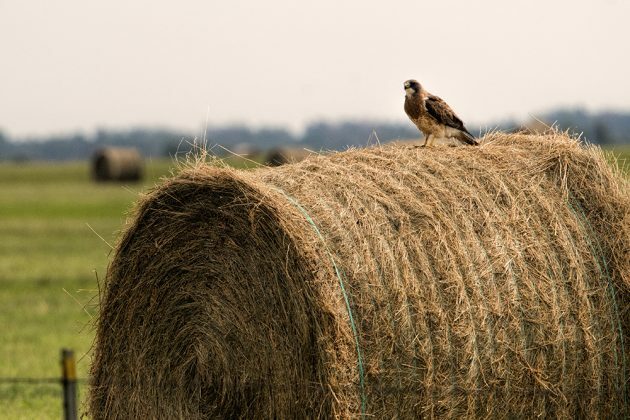 Occasionally, we would see a bird perched on a hay bale, usually a hawk, usually a Swainson’s Hawk. I saw a couple of Swainson’s Hawks perched on wooden posts too, nice and low, but they sadly flew off before I could say, “Stoooooppppp the caaaarrrrr!” I see no reason why Swainson’s Hawks should be deprived of their moment of glory in this post because our car was too fast and my brain was too slow, so here is the hawk on a hay bale. 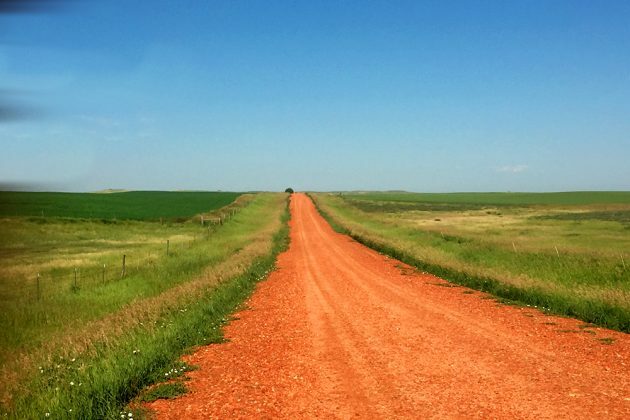 North Dakota is one of those under-birded states that is simply full of birds, and the absence of scads of our compadres and tourists in general was exhilarating. I focused on prairie birds in this post, but keep in mind that breeding ducks, nesting grebes, and squadrons of White Pelicans populate the lakes of North Dakota, Black Terns fly over those lakes, Ferruginous Hawks sit in the middle of the fields, and western birds like Rock Wren and Bullock’s Oriole are found in the Badlands of Theodore Roosevelt National Park. Having been attached to books all her life, Donna Lynn Schulman is thrilled to be engaged in a passion that requires fealty to an information artifact called a “field guide.” Donna divides her birding time between Queens, New York, where she grew up, and central New Jersey, where she is on the adjunct faculty of a very large public university. Donna was a Library Journal book reviewer for 15 years, reviewing over 100 titles, and has also reviewed labor relations books and contributed articles on labor relations research to specialized journals and monographs. She wrote her first birding book reviews for the Queens County Bird Club’s News & Notes, which she formerly edited, and has also reviewed for the American Birding Associations' Birding magazine. Donna was recently pleased to talk about the top birding books of 2017 with Nate Swick for the ABA December podcast. When she is not birding or working on her nature photography, Donna travels to Florida, where she attempts to turn her young nephews into birders (so far, they are fisherman who send her photos of birds), to Los Angeles to visit her writer daughter and son-in-law, or somewhere wonderfully new and birdy. She also contemplates someday writing an article for her blog, Queensgirl. Nice photos and cool place. ND is on my list of places to visit, but it is exceedingly inconvenient to get there from Portland and it seems like a tough place to bird solo. Remarkably, ND is actually well-birded by the 10000Birds Collaborative, with more birds than Texas, Georgia, Virginia, and Pennsylvania. What a great trip thru North Dakota! We just left South Dakota, and it was not nearly rewarding for us. A little too late inn the year I guess. Excellent photos too!